Our Vice President, Mike Bradley, put his name forward as Observatory Director and this assignment has been approved by the Board of the SCC. Mike has put a lot of work into the observatory and is responsible for the design of the electronics for the mount and telescope. Mike has his own observatory in Roberts Creek and is an avid astrophotographer. Mike will be in charge of scheduling and maintenance for our SCC Observatory. We will be teaching an introductory course on the use of our SCC Observatory at our meeting at the Sunshine Coast Arts Centre at 7:30 PM on Friday, 11 December. People interested in becoming Qualified Operators of the SCC Observatory should attend this session. The Operations Manual for the SCC Observatory can be downloaded from the Observatory page of our web site. 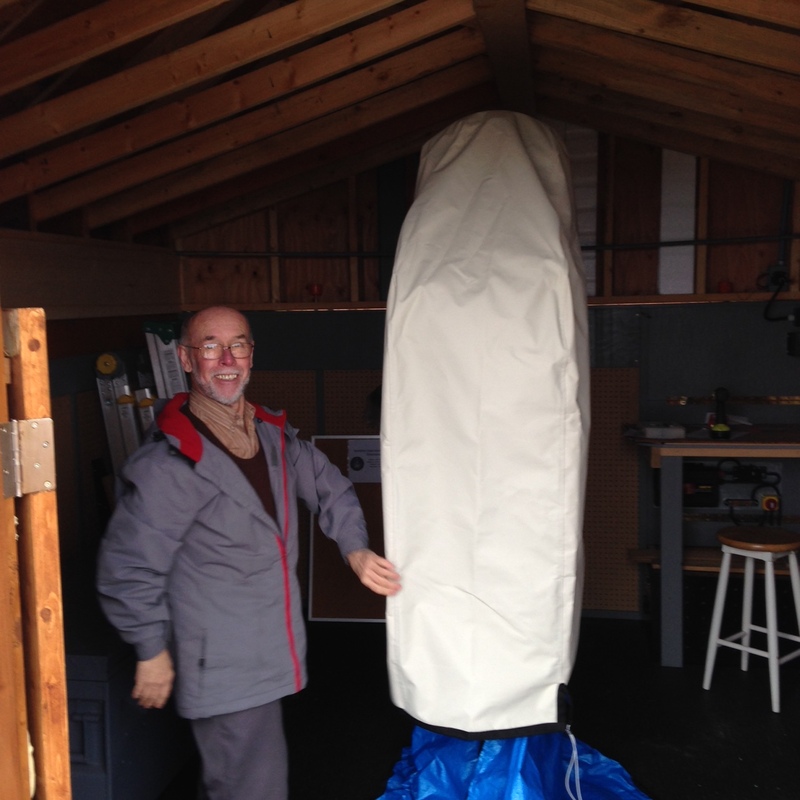 Our new telescope cover has arrived and was installed this weekend by David and Michael. Unlike the previous cover, this one is insulated. They also installed a new custom heater box to maintain the temperature inside the cover to suppress dew formation. These changes have been incorporated into the Operational Manual, which you can download from the Observatory page of our website. 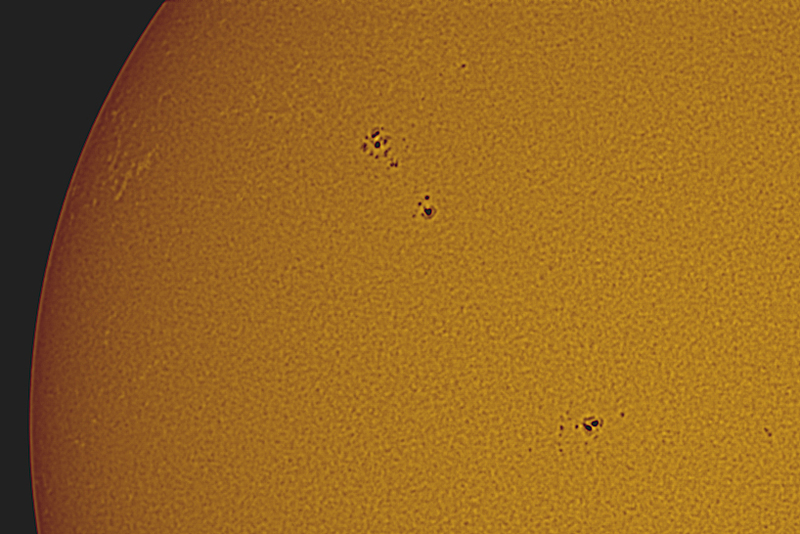 I took advantage of the clear skies yesterday to take an image of the large group of sunspots (AR2449) while it was still there. Unfortunately the group is very much smaller now than it was last week, but still made a nice image. Attached is a white light shot, taken in monochrome, then cropped and colourised. It was a stack of 300 images. I decided to take the images from the observatory as the wide horizons make it possible to follow the sun at this time of year without worrying about it hiding behind trees, unlike at home in Roberts Creek! Our speaker at the Sunshine Coast Arts Centre on 13 November at 7:30 PM is Dr. James Di Francesco from the NRC. 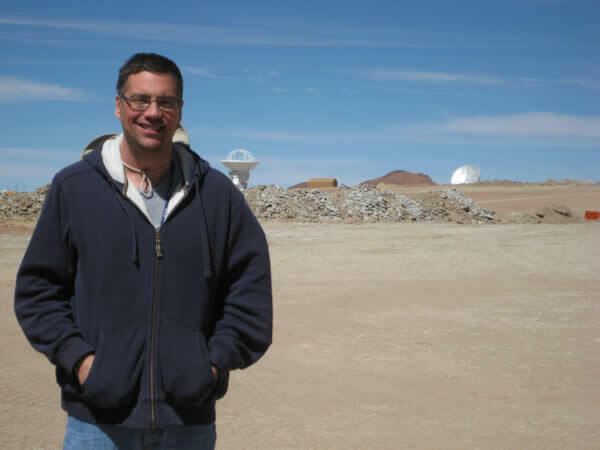 His topic will be ALMA and the Art of Planetary Formation, in which he will describe his work with the Atacama Large Millimetre Array. NOTE: Our elections for the 2015 AGM will take place at 7 PM. Public will not be admitted until 7:30. I discussed our Sunshine Coast Centre with past president Bill Clark the other day, and he observed that the Sunshine Coast Astronomy club he founded back in 2004 was entering a new era. As Bill saw it, his watch was all about building the club. If he sought a single word to describe his era, that word would be foundations. Our early years were all about creating our Centre’s tradition of community service, as well as fulfilling the dream of building an observatory. We both agreed that on my watch things have changed. As we enter our twelfth year, our centre is currently building on the foundations laid down by our original members. Our SCC Observatory has had its first light and is now in use. If I had to use a word to describe the era we are now entering, that word would be exploration. We’re now starting to reach out from our foundations to try new ideas and see what we can achieve. Our National HQ already recognizes that the SCC is one of the most active centres in the country. I believe we can make them start describing us as one of the most extraordinary. We log over 2200 hours of volunteer work at outreach events every year. This is a deceptive figure, as only a small group of members have put in all these hours. In future, I’d like to see more members come forward and help. Some members seem reluctant to involve themselves in outreach as they don’t think they know enough about astronomy to face the public; we’re going to help members to give them the support to make them feel comfortable. We added to our busy outreach program: Roberts Creek Earth Day and Synchronicity Arts Festival in Gibsons. However we came to a realization that we were doing an enormous amount of outreach and next to no inreach. Therefore we deleted a number of unproductive outreach events and are largely replacing star parties all over the Sunshine Coast for community groups with viewing sessions at our observatory. We’ve deleted Astronomy in the Park from our outreach events. Even though Astronomy in the Park was one of the most productive events on our calendar for 11 years, two years ago the contractor running BC Parks on the Coast started asking us to pay $100 to use the park. We talked the contractor into waiving the fee last year, but this year the contractor blamed pressure from BC Parks and forced us to pay it. I approached our local MLA to report this problem. Kim Tournat, Constituency Assistant to MLA Nicholas Simons, got back to me to inform me that BC Parks is blaming the contractor and the contractor is blaming BC Parks. We aren’t paying the BC government $100 for the privilege of staging such an event. We are going to replace Astronomy in the Park with Astronomy at our Observatory this year. We’re planning to have more member events this coming year. Past President Mike Bradley and I have just published the SCC Observatory Operations Manual V 1.0 and put a link to it on the “Our Observatory” page of our web site. I encourage anyone who would like to use the observatory to download the manual and read it. Operating the observatory isn’t difficult and we encourage our members to use it. We started as a club with frequent members star parties, and we want to bring that back. We revived our Light Abatement efforts with presentations to the Sandy Hook Community Association, the Davis Bay Wilson Creek Selma Park Community Association, the East Porpoise Bay Community Association, the Roberts Creek Community Association, the Rotary Club, and the Hospital Auxiliary Association this year. We hope to make a presentation to the District of Sechelt to have them register themselves as a Dark Sky Community in the coming months as well as lobbying to have them change their building bylaws to require full cut-off lighting. We replaced our web site in July 2014 with a WordPress site that allowed us to track activity. We had an exceptional month for views of our web site in August: 1,832 views, which is nearly twice the previous record. In September we broke the record again with 2,251 views from 338 visitors. By the end of 2014 we had 4,626 views of our web site from 1,385 visitors. So far this year we’ve had 10,851 visits from 3,421 visitors from 66 countries and territories. That’s 15,477 visits from 4,806 people. Several youth organizations have complimented us on our web site. Our speaker’s program started in our early days has evolved into at least 8 nationally recognized experts doing presentations at our meetings every year. We lead all the other RASC Centres in use of the national Public Speakers Program. We have plans to bring in a fund raising event with a keynote speaker in the coming year. 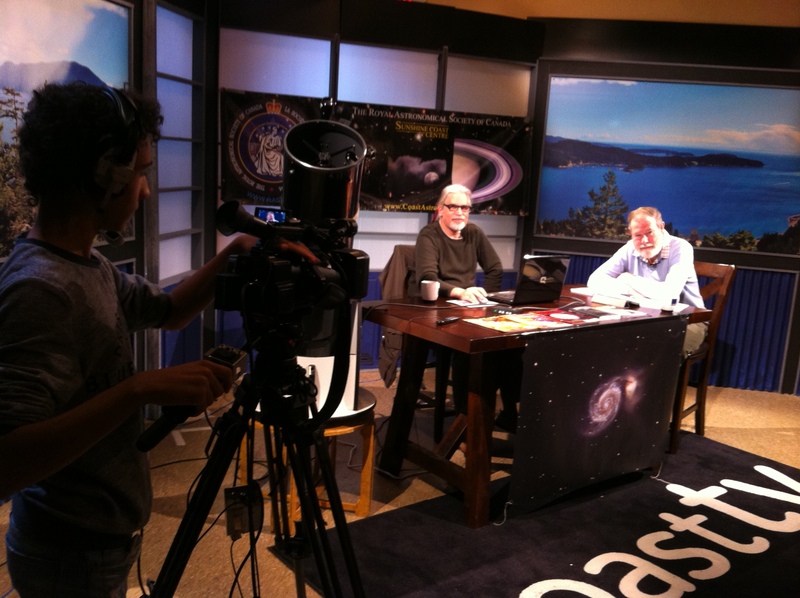 We created one of the past president’s dreams: An astronomy TV program, Night Lights. Other RASC centres have attempted this, and spent thousands doing so, and never went beyond a few episodes. Our SCC entered a partnership with Coast Cable that costs us nothing; in fact they pay for our meals breaks and for road trips to video tours of astronomical facilities. Our Night Lights program is now going into its second season, with taping of sessions for this season going on this month. Word of this has reached Telus, who have approached us to see about entering into a similar partnership. If you’d like to be part of this, please let us know. We realized the past president’s dream of an operational observatory, but this means that for the first time in our history we need an operational budget. We must have an operational budget plan because one of the common errors made by other RASC Centres over the years is a lack of budget planning coupled with uncontrolled spending to purchase gadgets for their observatories, landing them all in financial difficulties. People donate equipment to these centres, which is appreciated, but if it doesn’t fit into an operational plan they end up being pushed in directions that they may not be able to sustain. We are not going to let that happen here. We’ve created a budget plan and following the lead of successful RASC observatory programs such as those run by the Prince George and Okanagan Centres. We are committing ourselves to specific objectives and working towards them. We are submitting requests for grants from the Sechelt Community Investment Program, the Sunshine Coast Community Forest Legacy Fund, the BC Gaming Policy and Enforcement Branch’s Community Gaming Grant, the Sunshine Coast Community Foundation, the Rotary Club, and even a Wood Council of BC award. These grants will allow us to insure and maintain the observatory, add accessories to our telescope and its systems, and have a warm room built to control the telescope. Although we reached a point at the end of June 2015 where our observatory became operational, it is not yet finished. At the end of June we still did not have a roof retraction mechanism, we still did not have lighting in and around the observatory, we still had no protective cover or dew control system for our telescope and its sensitive electronics, and we still had not finished the roof soffits or closed in the gap between the rails and the roof to keep the weather and wildlife out. A small group of volunteers has pressed on completing the closing in of the observatory, installing and improving a dew control system, and installing a roof retraction mechanism. Lighting will be finished in the coming months as will upgrades to the solar charging system, which is currently running near capacity to power the dew control system. Only three months after I first joined this centre in 2013 I put myself forward as a director at large and the following year I stepped up as president. Last April I became the National Public Speaker’s Program Administrator for the RASC. This year I am putting myself forward for a director’s position on the National Board of Directors. Everyone in our Centre can help our Centre in some way, whether it is by volunteering at outreach events, helping set up and take down at the monthly talks, serving on a committee, or serving on our board of directors. I’m not asking any of you to do anything I am not prepared to do myself. What we’ve accomplished so far happened because a small group of members donated some of their time, creativity, and ideas, making us one of the most active RASC Centres in Canada, even if we are nowhere near being the largest. 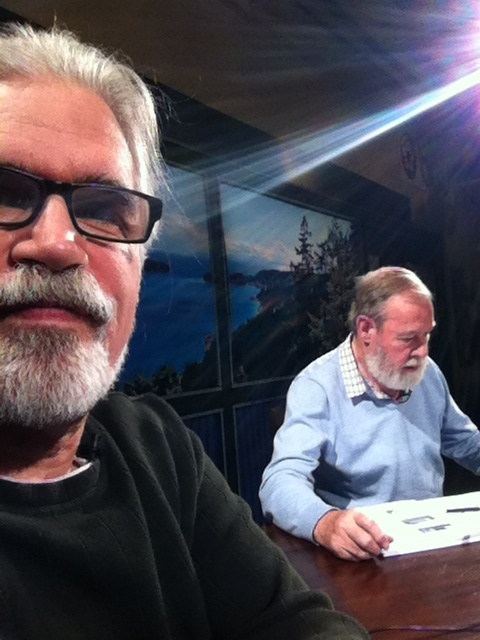 Got the first 8 episodes of the second season of Night Lights as well as a lot of the mail bag sessions taped today at Coast Cable’s studio at Elphinstone Secondary School in Gibsons. Hope to get the last episodes filmed this coming Thursday. Last night David, Mike, and Charles fine tuned the drift alignment of the telescope in the SCC Observatory. This involved setting up the camera on the telescope and focusing first on a star in the south (Altair) and then slewing the telescope slowly back and forth to see if the star returned down the same track. If the telescope is out of alignment, the resulting star track resembles a slim “V”. You then adjust the altitude of the mount and do it again until the “V” becomes a line. Then you switch to a star in the east (we used Algol) and do the same procedure, adjusting the mount for azimuth. 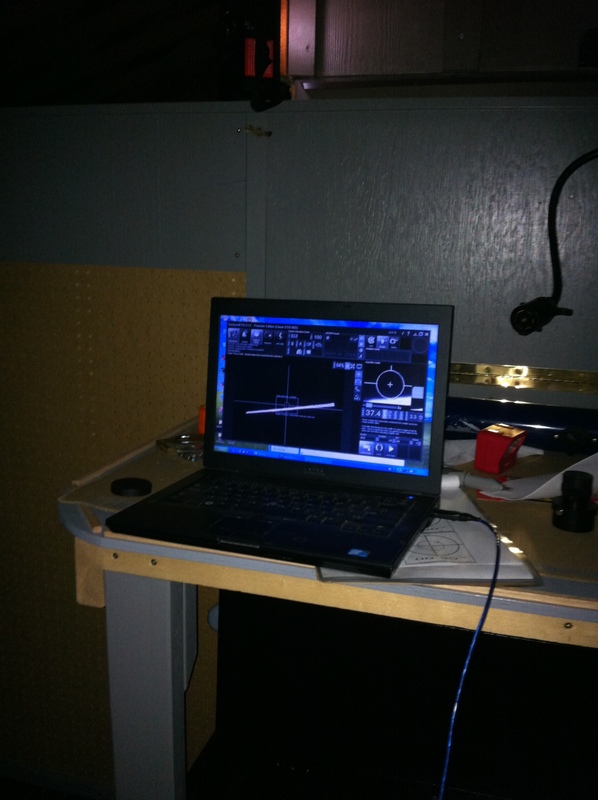 Then you go back to Altair and fine tune it… This took 3 hours but we’ve got a nice drift alignment now. Earlier in the day David tested the closure system he came up with for the space between the roof and rails. It needs a couple of adjustments but it looks like it is going to work well.